Earth’s only natural satellite is the Moon. It is thought to be as old as Earth, about 4.6 billion years. The Moon is made of rock with a core, a mantle that is partially molten, and a crust with craters created by meteorite hits. Basins and cratered highlands also exist on the surface. A soil called regolith covers the surface of the Moon, made of fragmented rock and dust. From Earth, highlands appear bright and craters appear dark. 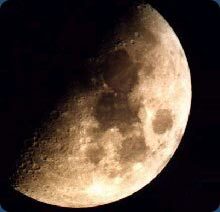 The same side of the Moon is always visible from Earth, as it rotates and revolves at the same rate. The Moon has no free water and practically no atmosphere, so there is no weather on the Moon. It was first visited by a spacecraft in 1959 and has been visited many times since. It is the only extraterrestrial body that humans have visited.